Techniques of mushiro [a type of straw mat] manufacture in Nishi-hira-dani in the Yonegawa area (formerly Yonegawa Village) in the City of Kudamatsu, Yamaguchi Prefecture were studied from July 4th to 5th. Nishi-hira-dani is a set of small mountain villages consisting of Nishi-dani and Hira-dani and is located deep in a valley of the Chugoku Mountains. After 1955, village inhabitants flooded to urban areas on the coast, leading to such severe depopulation that there are fewer than 10 families left in both villages combined. As part of efforts to promote the region, the Yonegawa area began efforts through local volunteers to revive techniques of making mushiro starting last year. Mushiro are folk implements that had long been an essential part of the lives of Japanese peasants. Techniques of manufacturing mushiro are more or less the same throughout Japan and have been so since the rise of modern Japan. However, the ubiquitous nature of mushiro meant that techniques of mushiro manufacture were seldom properly recorded for posterity. Since the mushiro in Nishi-hira-dani are made for personal use, mushiro are manufactured using the simplest of tools, presumably preserving an ancient form of mushiro manufacture. 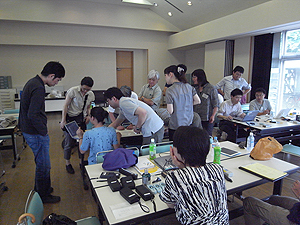 The current study seeks to revive, record, and carry on with techniques of mushiro manufacture through the assistance of local volunteers. This study also seeks to delve into and document life and conditions in villages that created folk implements like mushiro. The National Research Institute for Cultural Properties, Tokyo and the Archeological Survey of India (ASI) have implemented a collaborative project to preserve Ajanta paintings in Caves 2 and 9. This project is funded by the ‘Networking Core Centers for International Cooperation on Conservation of Cultural Heritage Project’ of the Agency for Cultural Affairs, Japan. 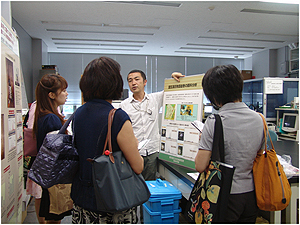 As a follow-up, the Japan Center for International Cooperation in Conservation invited Mr. Chandrapandian, an expert from ASI who oversaw the Ajanta Caves from July 23 to 28, 2011, to visit and an expert meeting was held on the 27th. 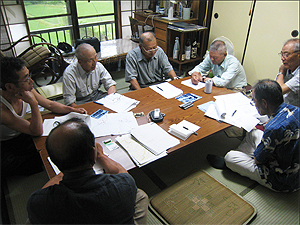 At the meeting, Japanese experts reported on the status of Ajanta paintings in Cave 2, covered by the collaborative project, and factors leading to their damage. Results of high-resolution photographic documentation of Caves 2 and 9 were also reported by the Japanese experts. 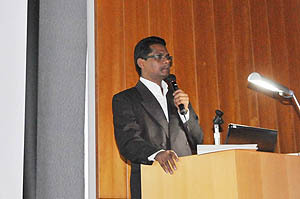 As a representative of the ASI, Mr. Chandrapandian reported on the ASI’s activities at other archaeological sites in India besides the Ajanta Caves. The meeting was a great opportunity to discuss how to better preserve the Ajanta paintings in the future.